Hi, I’m Fiona - the owner of Dogknows Richmond. I’ve been an animal lover my whole life, having grown up surrounded by many pets including our beautiful Old English Sheepdog Candy, the incredibly energetic Weimaraner, Amber and more recently my own dog, Betsy the Miniature Schnauzer and Harry the cat! At Dogknows Richmond we only use kind, force-free handling techniques to help build strong bonds of trust with the dogs in our care. We are one of only a few dog walkers in the area that have a professional dog walking licence for the Royal Parks. This means that most of our walks are in the stunning Richmond Park, allowing our doggie clients to have the very best adventures! We can cater for group or solo walks or even walks for the golden oldie that needs to take things a little slower. We also have a Puppy Play & Train service to help & support you in those all-important early weeks when your puppy first comes home. I am often out with dogs and driving during the day so the best way to get in touch is by text or e-mail. Then I can call you back as soon as I am free. Or you can send an enquiry form. Our experienced and friendly team will fit in with your schedule and take your dog for regular walks to one of the many pre approved parks or open spaces. I am particularly keen to enhance the lives of the dogs in my care whether they are a new puppy just starting out in the world, an energetic adult or a golden oldie who just enjoys a gentle stroll in the park. 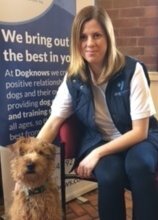 Because our policy is to take on regular clients who need dog care at least three times each week, it is possible to get to know each dog really well which means we understand their individual characters and traits so we can provide the best possible service for them and give absolute confidence for you. If you want more for your dog, why not test out the difference Dogknows can make?